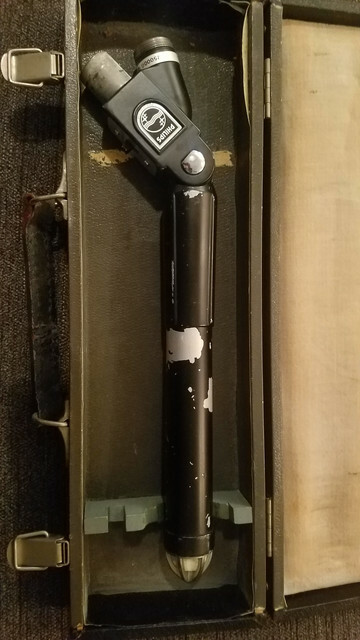 I recently purchased a lot of vintage mics, mostly older EV and a couple Shure. The person I purchased them from didn't know much about them, much to my advantage! However, there is one mic in this bunch that I'm not familiar with and cant seem to identify. My boss at the studio doesn't know, and all of the local area artists I work with do not know what it is. I'm going to attach a photo, any help identifying would be much appreciated! It's fairly mysterious to me considering I have a decent collection and am constantly surrounded by mics. Thank un advance to the entire community. It's a Philips EL6040 from the mid 1950s. 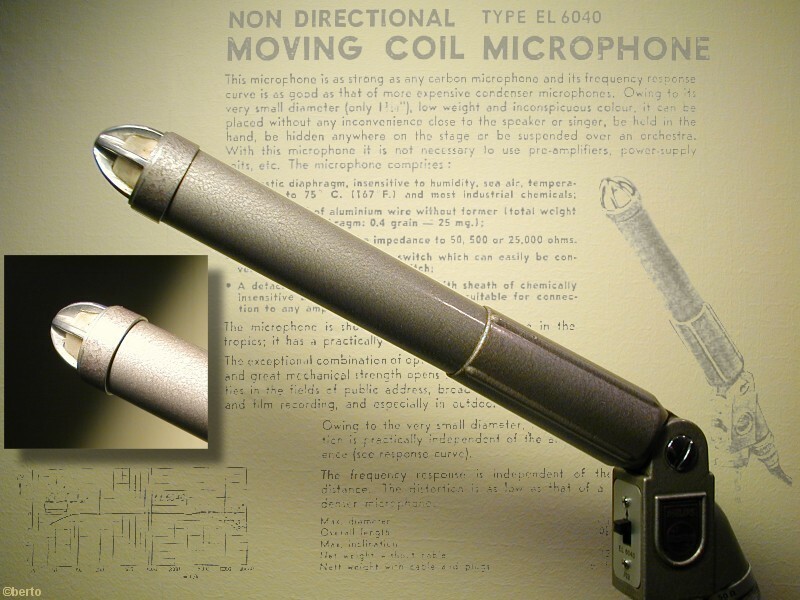 Its a moving-coil omni-pattern mic, intended for broadcast applications where it can be mounted out of sight but with the capsule positioned relatively close to the sound source in an elegant way. It has a wide bandwidth performance, with a strong high end, and a movable tube at the base to control the low end response. The connecting plug can inserted in three different orientations to select alternative output impedances..
Not the most refined sounding mics, as I recall -- at least not by more modern standards -- a bit boomy and tizzy, really... But probably very good for its time and certainly far more extended at the high-end than most moving-coil mics of the era. If your better half was a recording engineer with a passion for vintage gear you might not be far off the mark! I would think nostalgia is part of it. But I wandered into a vintage car show a week ago and I found that not all the owners were old guys. Some were younger keeners who loved cars of that era. There was also a live band of what looked like 14 or 15 year olds playing cool tunes that were way older than they were. Perhaps it is also part what we feel will inspire us? Ariosto wrote: With so many wonderful modern mics I'm surprised that so many people are seeking vintage mics. It is the same as guitar players wanting vintage guitars. An awful lot of people in the music business see the 60's and 70's as some kind of golden era and they want their music to sound like it could have been recorded in that era. Music listeners have become accustomed to hearing certain sounds and recording a vocal through something like an old U87 often gives you an instant 'it sounds like a record' reaction. I think it's a chicken and egg situation. Many of the modern mics that are released are basically copies of old Neumann or AKG designs. This both reflects the demand for the originals and reinforces it, because the new mics often come across as a slightly inferior alternative for those who can't afford the originals. I have two old AKG D202 mics (dynamic) which I bought in 1974! I think they cost about £120 each. They are still in working order. I don't think the modern versions are inferior at all, and I have a Sontronics Sigma active ribbon mic which sounds wonderful. Also AKG C414 XLS which is a modern version of an old mic from the 1970's and which is also excellent. I also have some other excellent ribbon mics by Royer, which, as you say, are much improved versions of the older ribbon mics. Ariosto wrote: With so many wonderful modern mics I'm surprised that so many people are seeking vintage mics..
Because it feels cool, perhaps.. and the allure of the silver bullet is always there. Certainly the most...tumescent mic I've ever seen.